This book is devoted to integration, one of the two main operations in calculus. In Part 1, the definition of the integral of a one-variable function is different (not essentially, but rather methodically) from traditional definitions of Riemann or Lebesgue integrals. Such an approach allows us, on the one hand, to quickly develop the practical skills of integration as well as, on the other hand, in Part 2, to pass naturally to the more general Lebesgue integral. Based on the latter, in Part 2, the author develops a theory of integration for functions of several variables. In Part 3, within the same methodological scheme, the author presents the elements of theory of integration in an abstract space equipped with a measure; we cannot do without this in functional analysis, probability theory, etc. The majority of chapters are complemented with problems, mostly of the theoretical type. The book is mainly devoted to students of mathematics and related specialities. However, Part 1 can be successfully used by any student as a simple introduction to integration calculus. 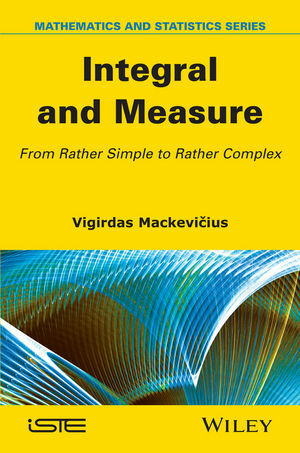 Vigirdas MACKEVIèIUS is Professor of the Department of Mathematical Analysis in the Faculty of Mathematics of Vilnius University in Lithuania. His research interests include stochastic analysis, limit theorems for stochastic processes, and stochastic numerics.